STOKER CON in LAS VEGAS! *Barnes and Noble will be selling my books in the DEALERS ROOM throughout the Con. 7:30 PM – 10:30 PM Bram Stoker Awards® Banquet - HALLOWED is nominated for a Bram Stoker Award in the Young Adult Category. Please check out the full schedule for signings and amazing panels. I will be signing all ghostgirl books and The Blessed Trilogy. So you want to write horror for kids and teens, but how far is too far with your scares? Is there a limit to what you can write for middle grade and young adult readers? Is there a limit to the kinds of monsters you can create? Our panelists discuss how to approach crafting horror for middle grade and young adult readers. From the Death Salon to the Death Museum, from permanent memorialization to cutting-edge composting of corpses, from Death Cafes to the Right to Die movement, death is in the news these days. Come get your questions answered and find inspiration in how to make death matter! Followed by a signing at Horror Writers Association booth with giveaway. 4:00 PM in NYC - YA LEGION TOUR! With Kami Garcia, Lauren Oliver and Richard Kadrey. Writers that mystify whether with magic or suspense are here to share. THE BLESSED EVENT at Saint Ann’s Church in Brooklyn! and music performances by Gus + Scout, Stephen Merritt of Magnetic Fields, and Vince Clarke! **Come and worship! Books sold on site. Panel: Passion, Power and Paranormals! 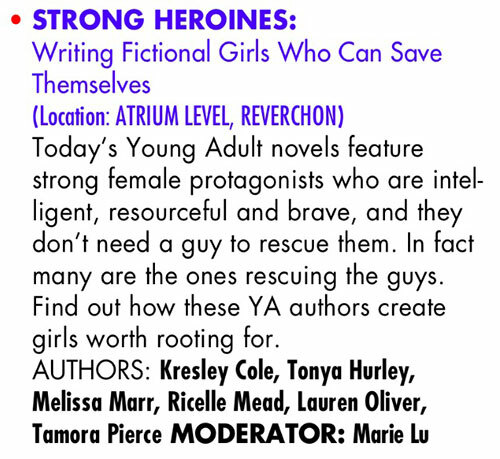 Authors Keri Arthur, Maureen Johnson, Tahereh Mafi, Tonya Hurley, Margaret Stohl, Dan Krokos, Alexandra Bracken and Kalayna Price discuss the inclusion of romantic elements in their action-packed novels. If dating the undead wasn’t tricky enough, these protagonists must also battle the forces of evil while trying to keep their sanity and the world safe from destruction. Moderator Jocelyn Davies will have the authors divulging the steamy details behind creating their characters and their tricky love affairs. Gayle Forman (If I Stay), Tonya Hurley (Blessed), Robin Wasserman (Seven Deadly Sins series), Michele Jaffe (Rosebush), Natalie Standiford (How to Say Goodbye in Robot), Adele Griffin (Picture the Dead). NOTE: This is the 4th Annual Halloween Festival, that includes a scary walking tour of the cemetery (facts about those buried there), a reading of works written by famous writers buried there, a costume parade, lessons for the “Thriller” dance, and a paranormal walk! The Barnes and Noble will selling copies of the ghostgirl books at the event. 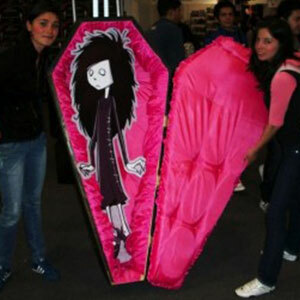 ghostgirl books will be for sale on sight for school visits by The Golden Notebook.